Monitoring broadcast station carriers on MW can give some interesting results. Not only are transmitted carriers generally offset from each other by a few Hz, but it's also easily seen when European, Asian and trans-Atlantic stations fade in/out compared to the local (groundwave) stations. 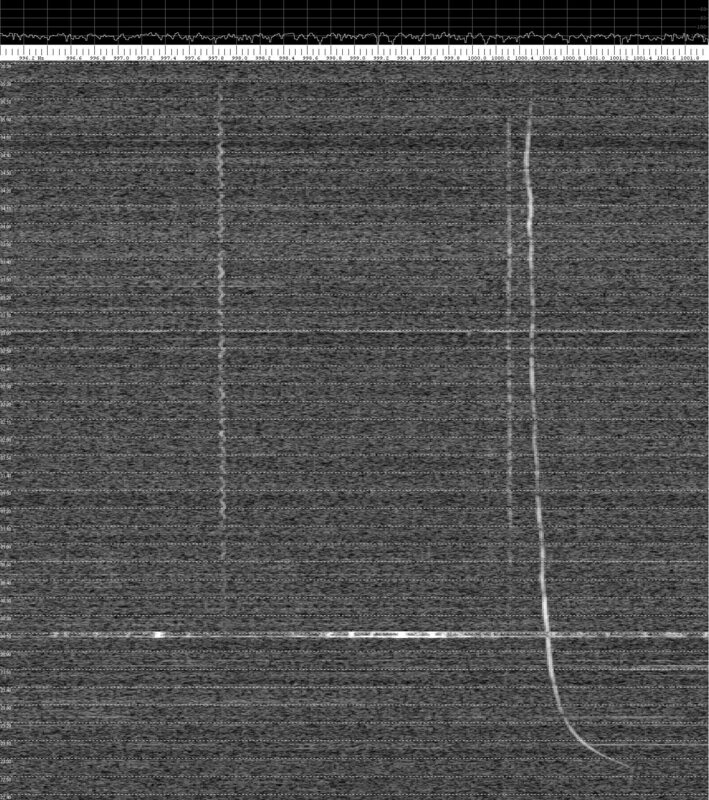 To generate the traces, I tune my AOR 7030+ communications receiver 1 kHz below a channel in USB mode using the remote control ... for instance tuning to 1349.000 kHz ... and use Spectrum Lab FFT analysis software to analyze the resulting audio spectrum. Traces are usually run overnight, with the program auto-saving the screen display every 2 hours. 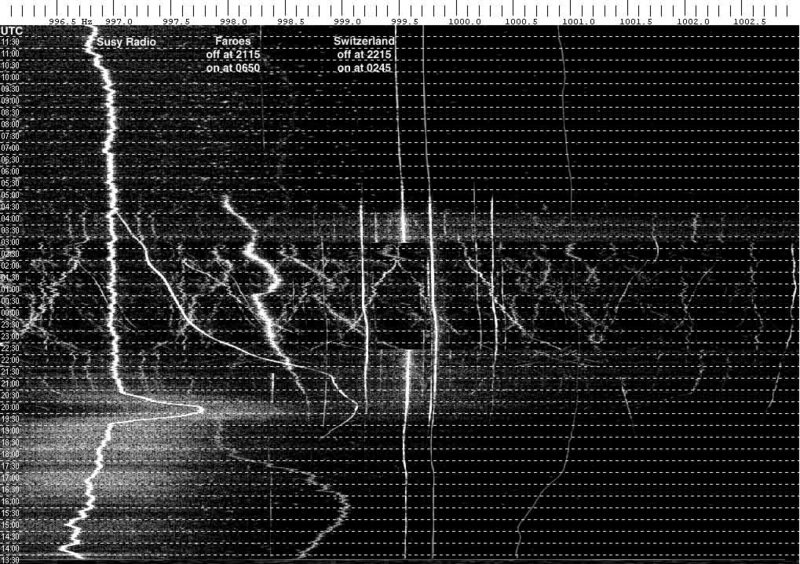 I then join up the saved traces in Photoshop to give the whole overnight trace. 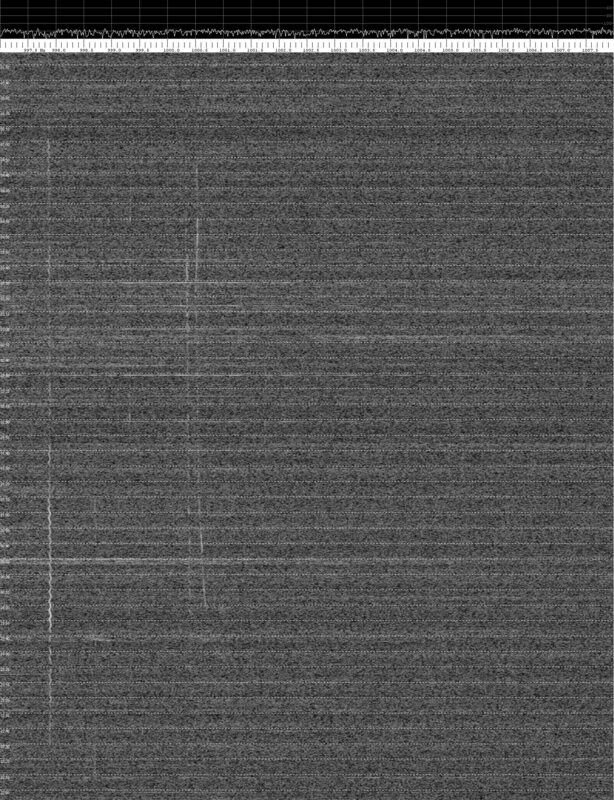 What I initially expected to see was a solid line at 1000 Hz (corresponding to 1350 kHz in this example), but in fact there is a lot more to be seen. Click here to download a Spectrum Lab user-settings file which I've set up. There are some settings that you may need to change depending on your set-up, but it ought to get you started. 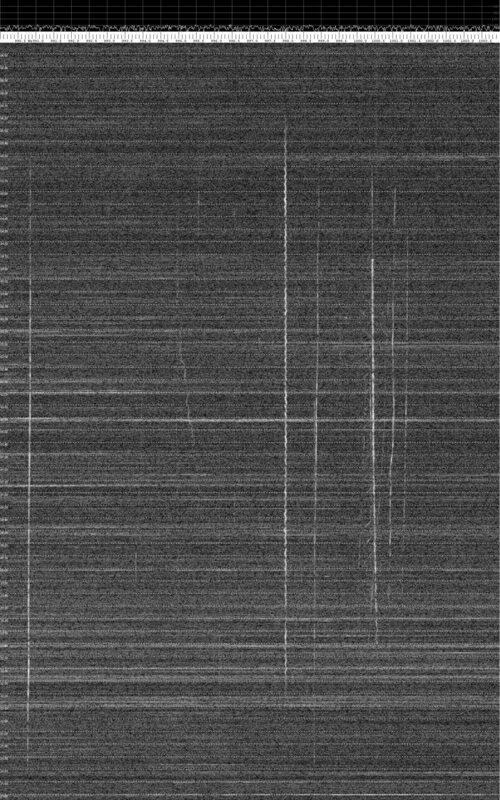 The scale across the top is the audio frequency in Hz, and the time in UTC is shown down the left hand side. I started off doing traces from midnight to midnight, but it soon became apparent that midday to midday was more appropriate. 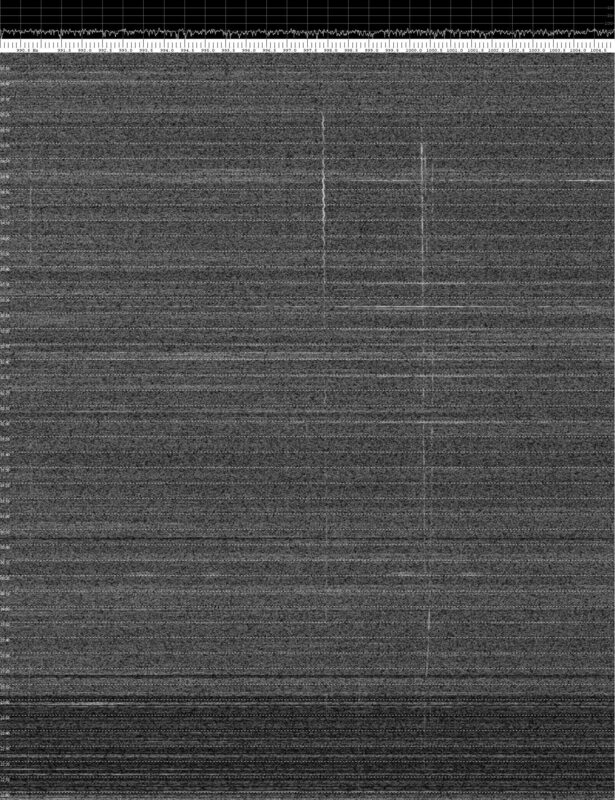 Most traces are around 1 MB in size even after jpeg-ing them down as small as they'll go. The AOR 7030+ tunes in 2.655 Hz steps, and the frequency settability from the keypad is +/- 1.4Hz (why don't they quote this as 1.3285 Hz - half the 2.655 Hz stepping?). The stability wrt temperature is very good, and I'm running the radio 24 hours a day. Without an exact audio reference or an exactly known station carrier frequency, it's therefore not possible to say what the exact frequency of a particular station is, but the relative offset of one station vs another is accurate (and precise). Please feel free to me if you have any more information about any of the stations included in these pages, or if there are any errors or suggestions. 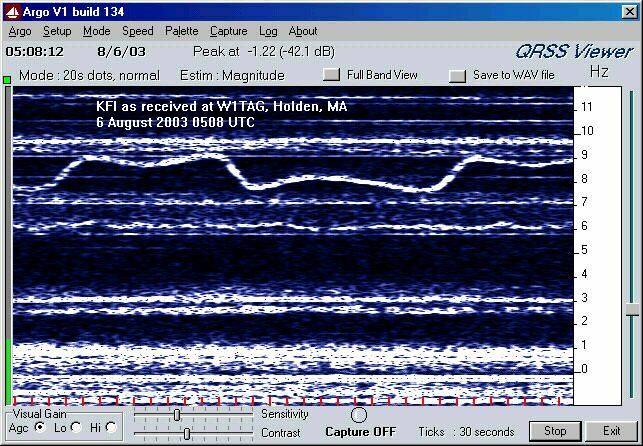 John Andrews (W1TAG), a member of the LowFer group, posted a screenshot of the Los Angeles station KFI 640's curious carrier shift on August 8, 2003, which shows an approximate square wave deviation with an 11.5 minute period. Since then other dx-ers from California to Florida to Ontario have also monitored this distinctive carrier trace. Steve Whitt noticed a problem with the audio on the BBC WS transmitter on 648 kHz from Orfordness, England. 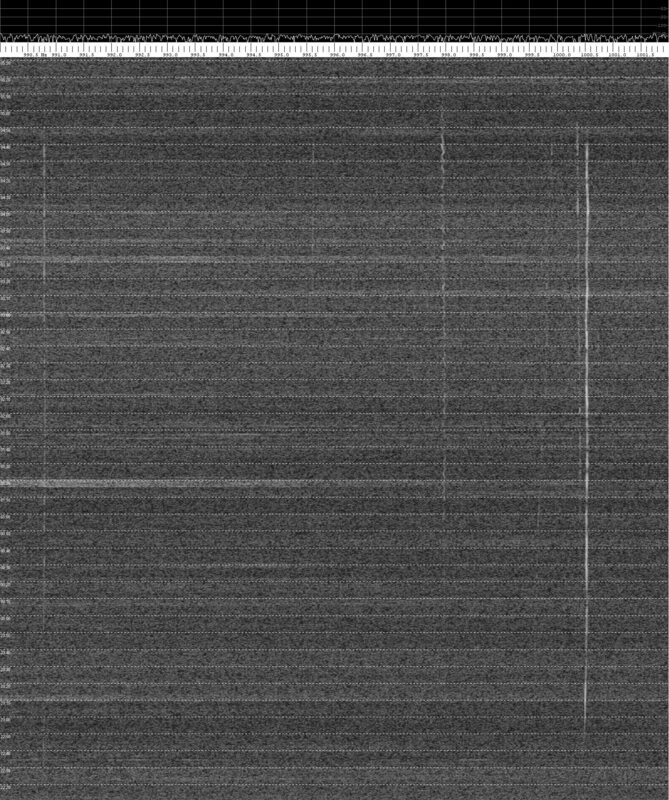 I ran a Spectrum Lab trace on this channel and there are clear heterodynes at plus/minus 50, 100, 200, 300, 400, 500 and 600 Hz from the main carrier. The ones at 100, 200 and 300 Hz are only some 35 dB lower level than the main carrier. 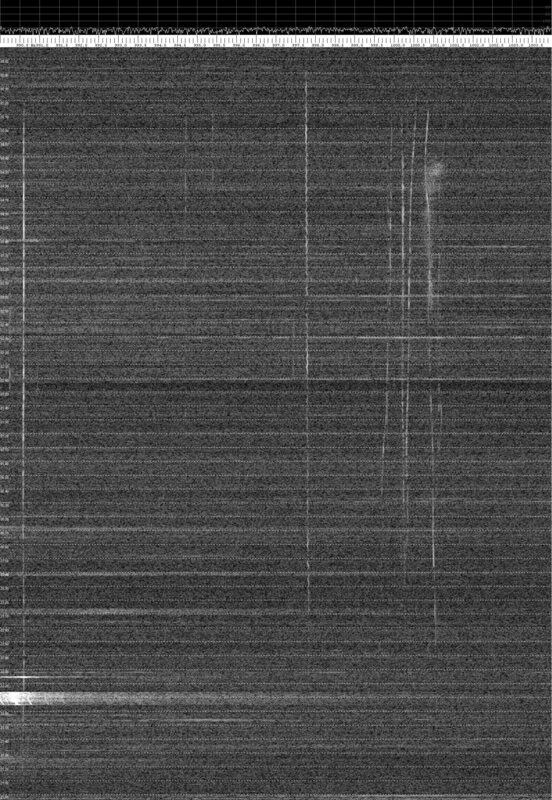 This may be related to Orfordness radiating DRM on its other MW channel on 1296 kHz. 531 kHz : Susy Radio was the dominant daytime station during August. Clearly visible are Beromunster with a 2215-0245 silent period overnight and the Faroes with silent periods 2115-0600 Mon-Sat and 2115-0900 on Sun. 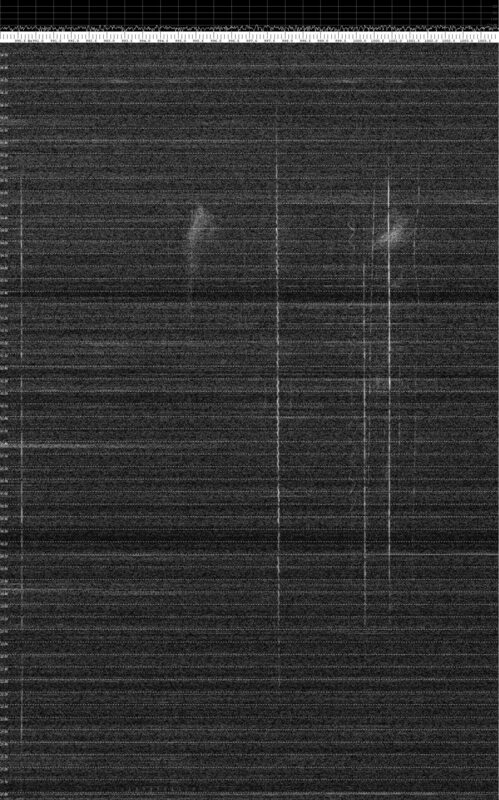 590 kHz : Three carriers visible just after midnight, strongest was VOCM on 1003.063 Hz. A very close-in zoom. 640 kHz : Trying to catch KFI's distinctive carrier. 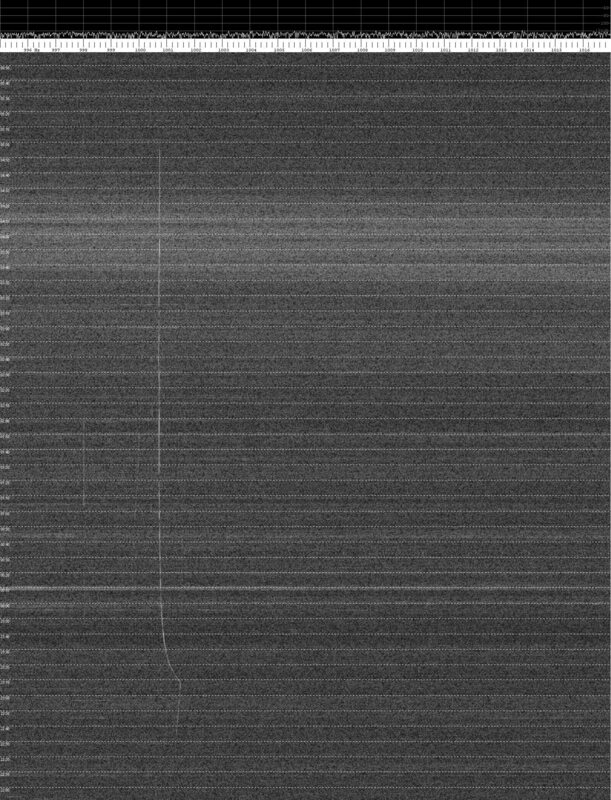 Two carriers noted on 11-12 Aug at 639.9980 and 640.0004 kHz. 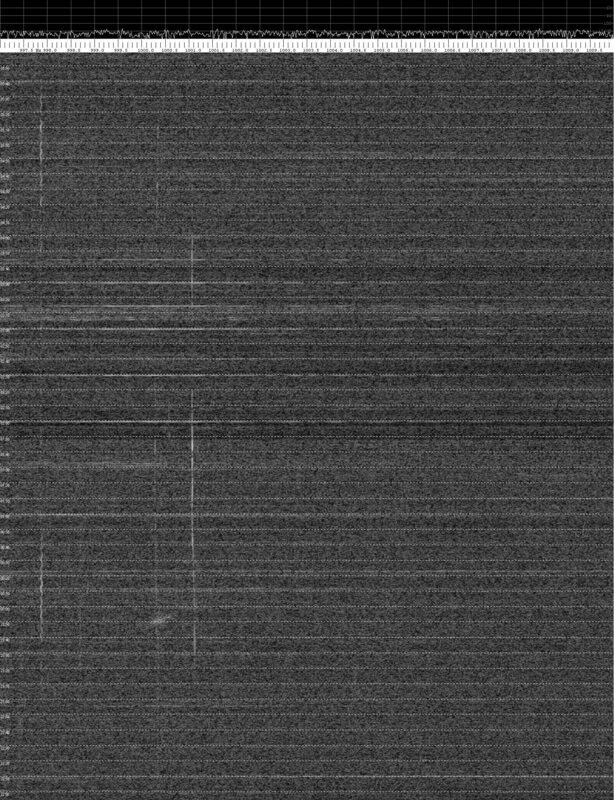 On 12-13 Aug, one carrier faded in at 2300 UTC on approx 640.0014 Hz drifting lower over the next hour to a constant 640.001 Hz until fade-out at 0500, a carrier with small squiggles noted on 639.9981 Hz from 0115 until 0530 fade-out, and a third carrier noted around 640.0005 Hz from 0200-0440 UTC although not continuously received. On 13-14 August the carrier that fades in early had a very noticeable trace ...2230 UTC fade in with gentle drift upwards, then an abrupt change at 2308 UTC with drift downwards until it became stable at 0030 UTC onwards. 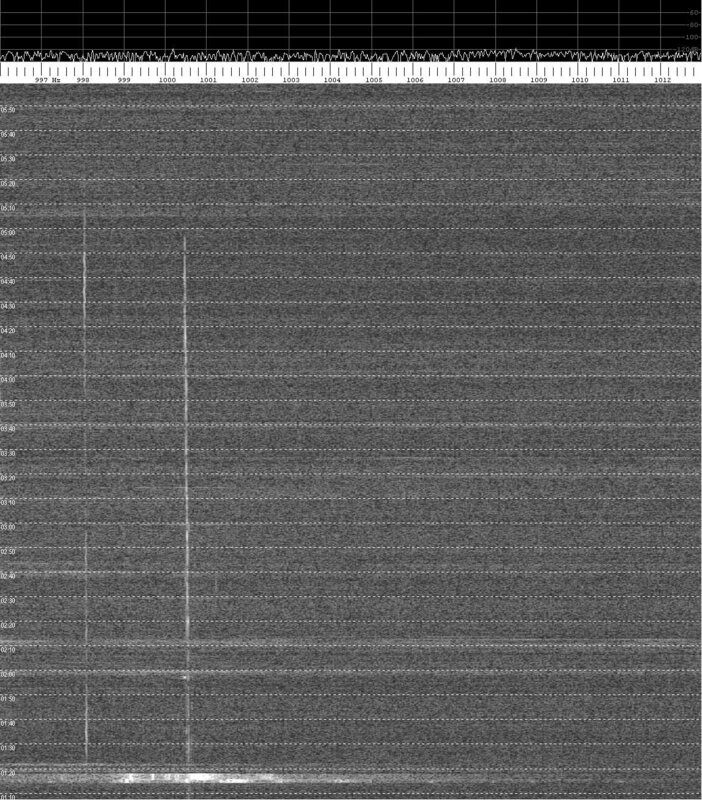 Also noticeable is a marked increase in general noise from 0330-0415 UTC. 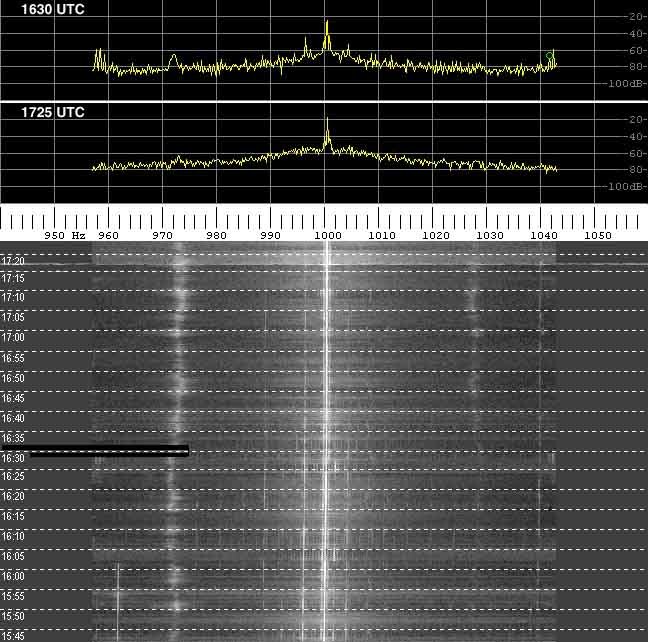 On 14-15 August, I widened the trace so I could see the carrier on approx 990.8 Hz which faded in at 2230 and faded out at 0440 utc. 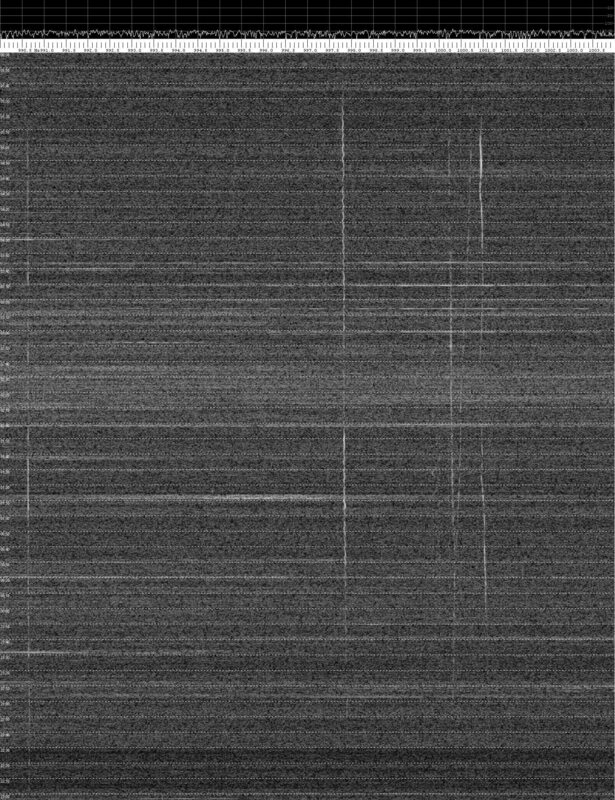 The carrier which I think is CBN faded in at 2240 and faded out at 0440 on approx 1000.5 Hz, without the drift I've seen on the past evenings around 2300. 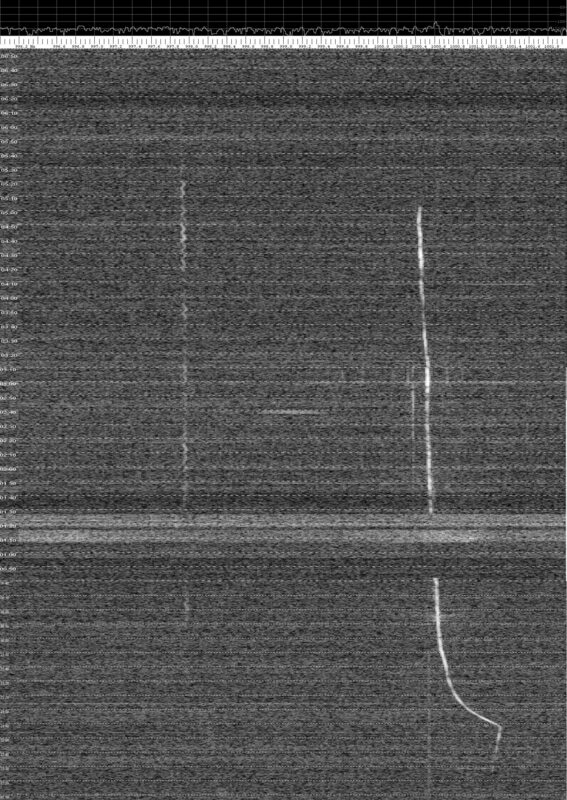 The carrier with triangular sawtooth shape on approx 997.9 Hz faded in at 0050 until 0500 utc. 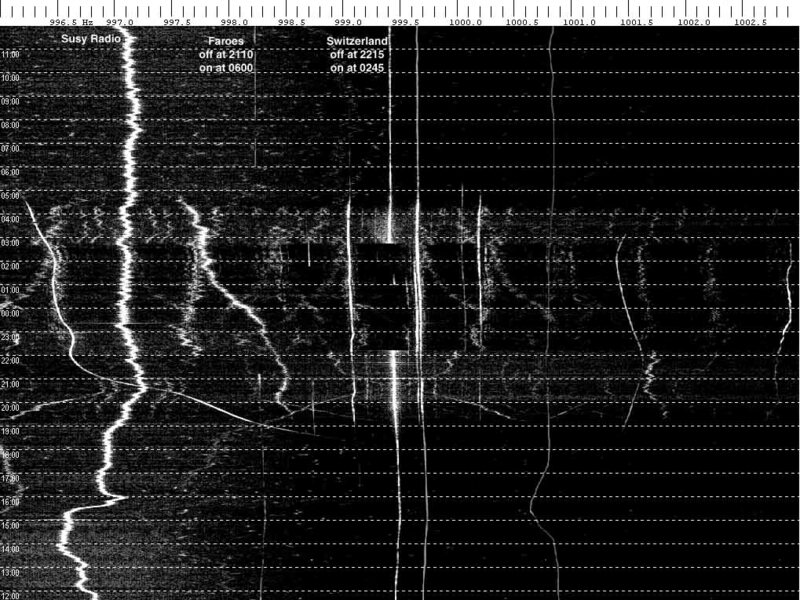 Three other weak carriers also noted 995.6 Hz, 999.9 Hz and 1000.38 Hz. On 15-16 August much weaker signals, with the usual 6 carriers noted. On 16-17 August again poor signals. On 17-18 August again poor signals, but again a distinct discontinuity with one transmitter at about 2300 UTC. August 19-20 ... not much visible, though it did pick up a little towards dawn. 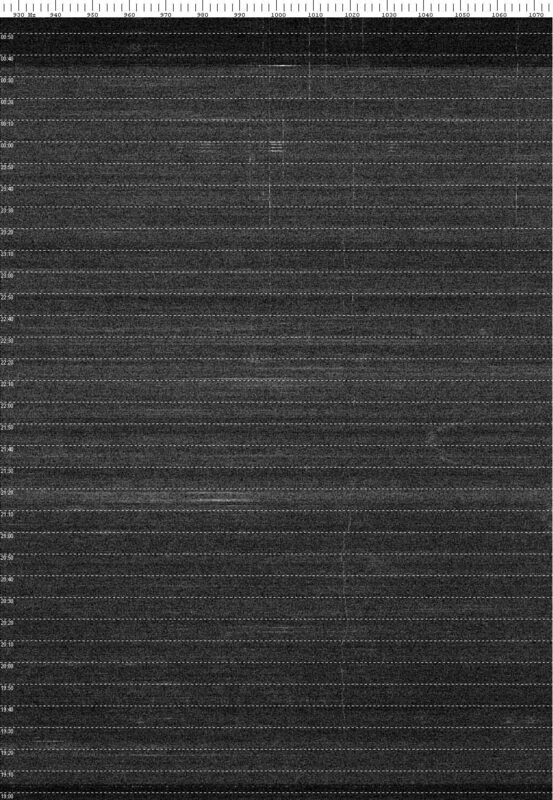 August 20-21 ... the wavy carrier around 997.8 Hz faded in at 2230 and out at 0500 UTC. The usual "dog leg" carrier can be seen around 2330 setting down on its night time offset. August 22-23 I turned the loop to favour South America at 0055 UTC. Instant boost to most signals on the trace, and it also brought in new signals, for instance the bigger sine-wave one around 1000.2 Hz. August 23-24 ... much earlier fade-in and later fade out of some signals while beaming WSW (about 250deg). 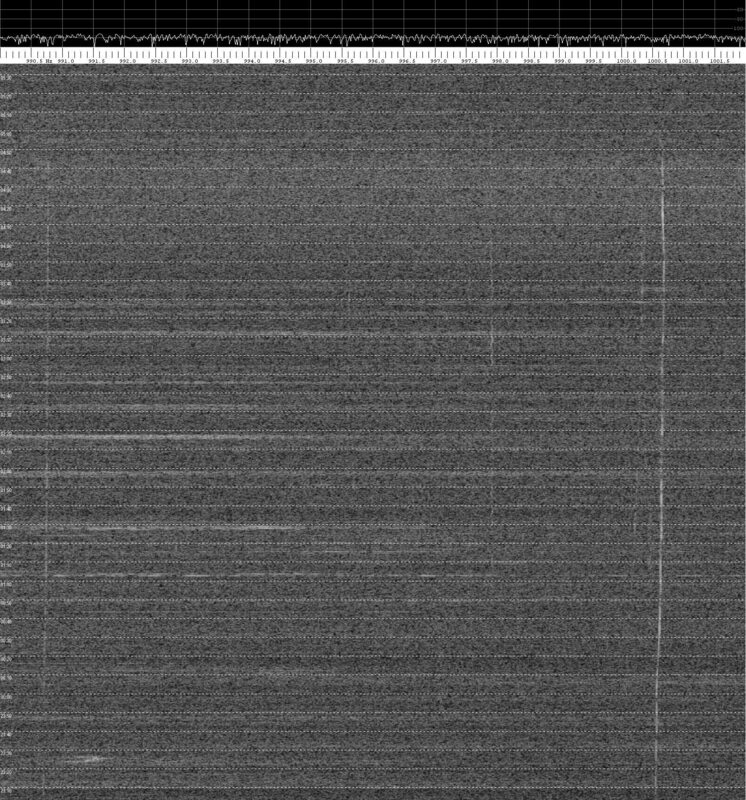 In particular the wavy signal on 998Hz didn't fade out until almost 0600 UTC. 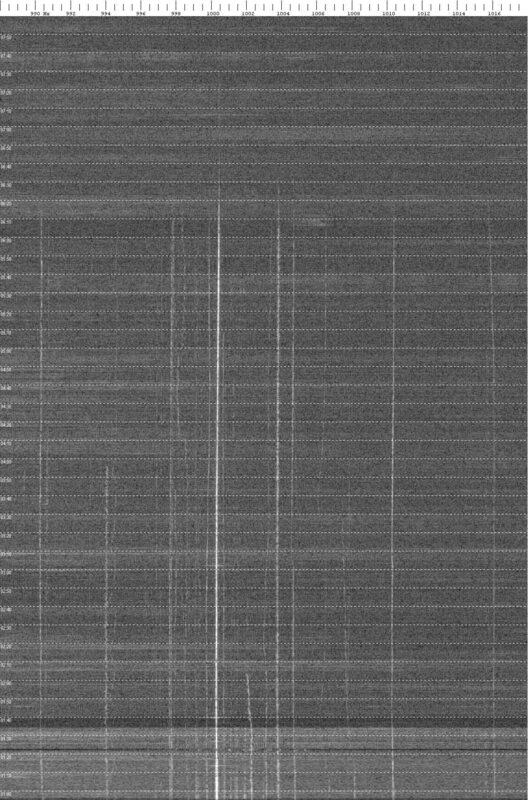 Also one on 1000.4 Hz looks like a distinct sign-off at 0406 UTC. August 27-28 ... turned the loop slightly more north again but not enough for what turned out to be a North American night. 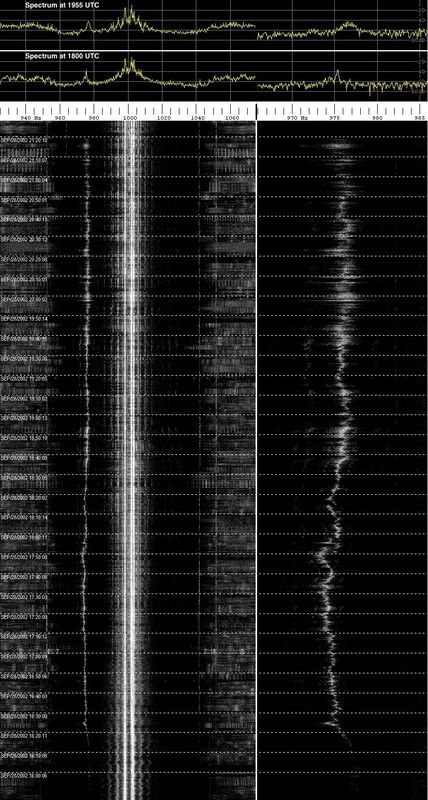 680 kHz : Not much doing here the first night, just three carriers on offsets 993.3, 1001.0 and 1003.3 Hz. 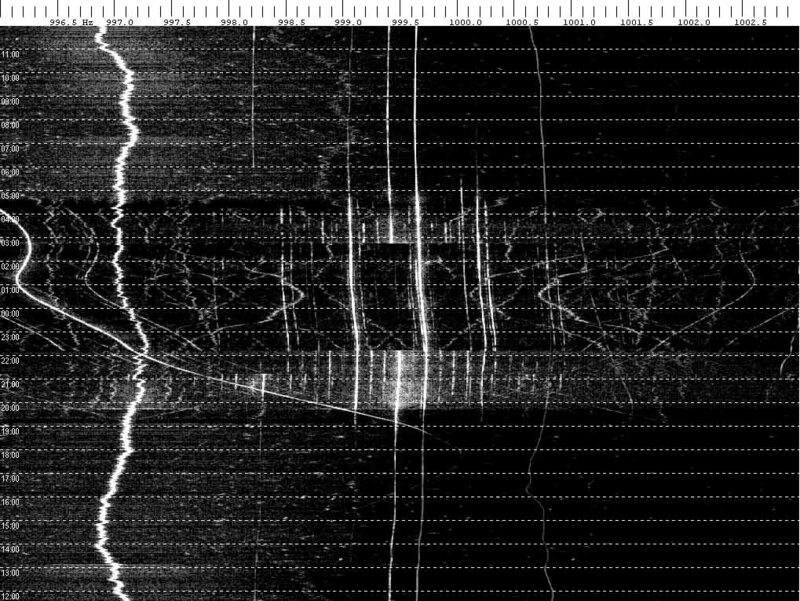 720 kHz : Everything in Western Europe appears to be 24 hours, but there was a sign-on at 1943 UTC, initially on 1025 Hz offset, which drifted down to a seemingly stable 1010 Hz and fading out at 2105 UTC. Possible candidate for this is Yuzhno-Sakhalinsk with 1 MW. Yuzhno-Sakhalinsk was again visible though much weaker on evening of 27th Sept ... Sep27a link. The Sep27b link is a much zoomed in trace close to 720.000, and near the top I rotated the loop to bring up the London transmitter for BBC Radio 4. Same again on the 28 Sept with a 1940 UTC switch-on. Longer period of reception on Sept 29 1942-2115 UTC. 1070 kHz : NOTE - I tuned to 1071 kHz and listened in LSB on this channel so 1000 Hz is still 1070.000 kHz but 1010 Hz is 1069.990 kHz. Many carriers here - CBA strongest. Also one that signed-off at 0203 UTC. CHOK Sarnia ONT was measured by Barry in Ontario and is the one just above 1010 Hz. Several stations can be seen de-powering or switching off on the 28-29 trace. Sept 29-30 great view of stations disappearing at local sunset. I have attempted to identify which carrier offset is which station ... 1070 listing. 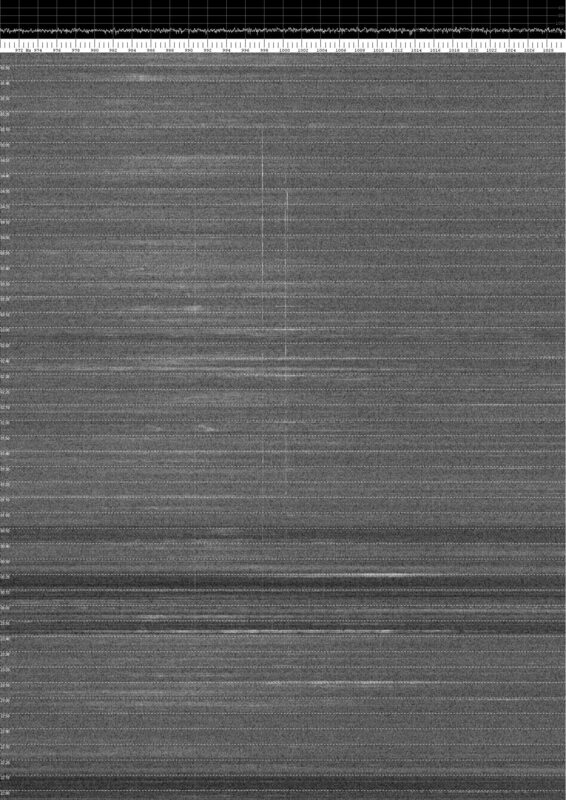 1170 kHz : There's not so much to be seen. My semi-local station is Eleven Seventy in High Wycombe. 1350 kHz : The dominant station is Hemel Hospital Radio. 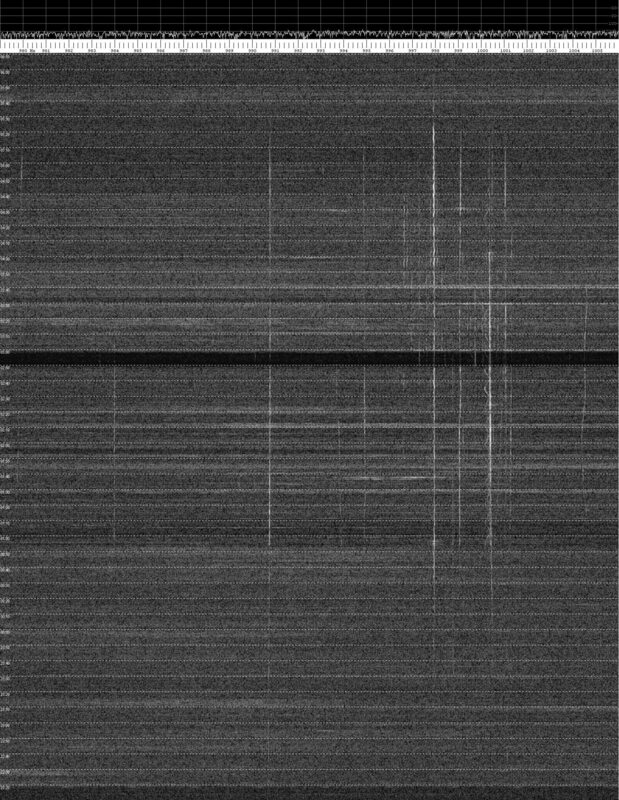 This appears to be on 1350.10105 kHz and has a large number of carriers symmetrically above and below the main carrier. 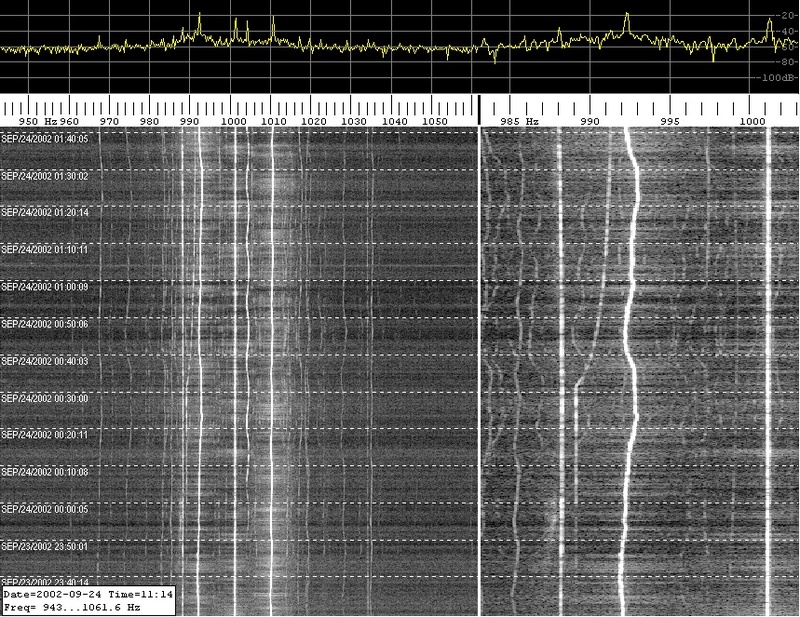 Two other groundwave stations are apparent, one varies 980-985 Hz offset, the other varies around 993 Hz offset. This latter one went off air 2020-2050 on 9th July. 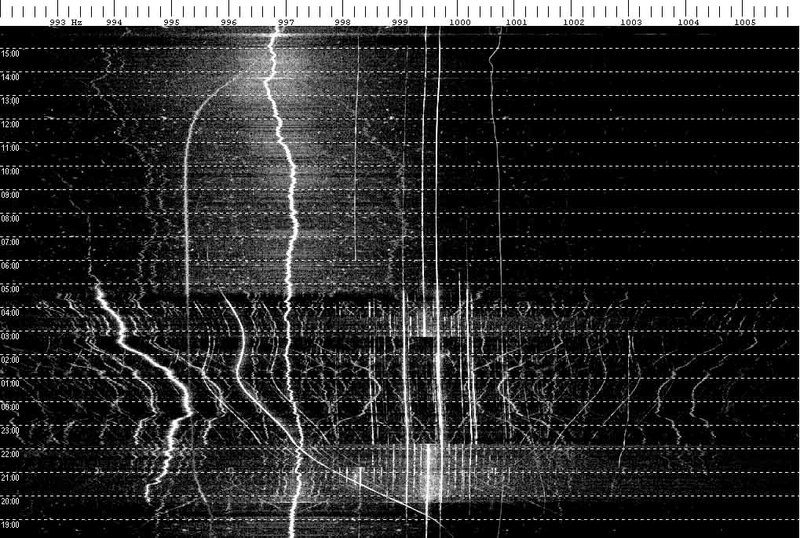 There are 2 apparent European stations that fade in around dusk - one around 985 Hz, the other at 1015 Hz. 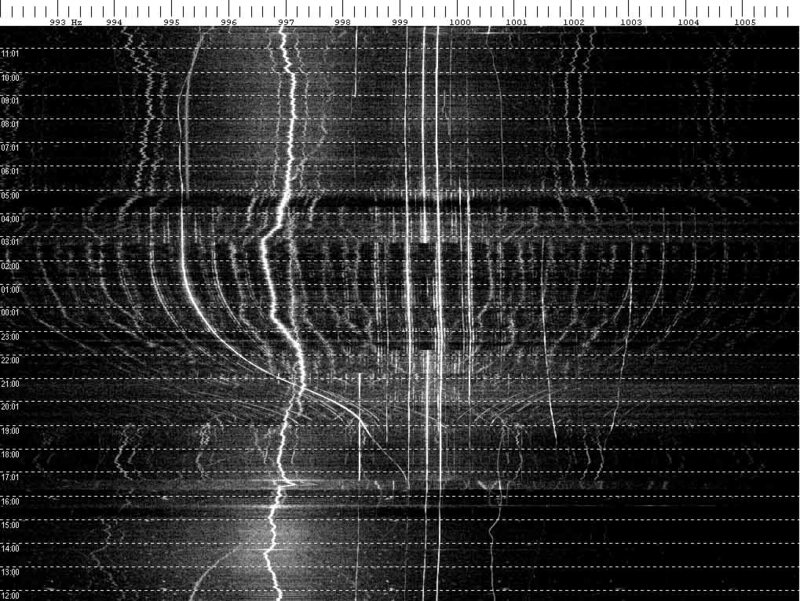 And there are two trans-Atlantic stations fading in much later - one at 992 Hz, the other at 1031 Hz. I have attempted to identify which carrier offset is which station ... 1350 listing. 2002 July 9 | July 10 | July 11 | July 12. 1431 kHz : Strongest stations are the Reading and Essex Classic Gold outlets, both very close to each other. Beaming N-S however brought in some more carriers, but not identifiable. 1440 kHz : It is easily seen when R Luxembourg switches to its highest power. The receiver's AGC kicks in and the trace almost loses all other carriers. Problem is that this currently occurs at the times when other Europeans would be fading in, as well as the dawn fade-out. But it does look like the two Russians sign-off at 2200 UTC, and there may be a trans-Atlantic carrier too. 1467 kHz : TWR Roumoules dominates this channel. 1470 kHz : Good dx channel this ... Several TA carriers. One signs off at 0100 UTC, another at 0105 UTC, a third sign-off at 0210 UTC, and a fourth at 0400 UTC ... plus what looks like several more carriers on until dawn fade-out. The 20-21 trace is a wider "window" and there's one more carrier visible with a higher offset, and even weirder a trace 1200-1350 UTC. 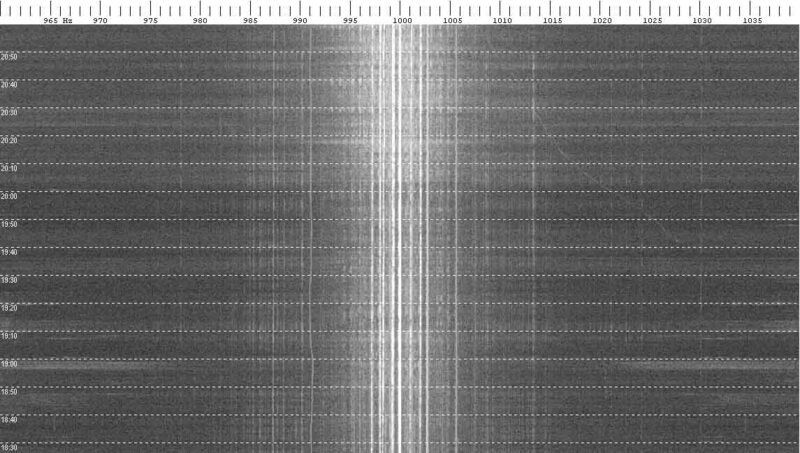 1548 kHz : Very interesting times for the fade-in and fade-out of the carrier seen on approx 976 Hz. Could this be 4QD in Australia? Monitored by Steve Whitt in York, England on Sept 28. Alf Ardal in Norway saw a very similar type trace on 1548 on Sept 29. 1566 kHz : County Sound in Guildford is the main station here. This channel also has AIR Nagpur India, and HLAZ South Korea. I have attempted to identify which carrier offset is which station ... 1566 listing. 1660 kHz : Steve Whitt noted one US station doing a power-down at 0030 UTC on Sept 23-24, which looks like being either KXTR Kansas City KS or KRZX Waco TX. 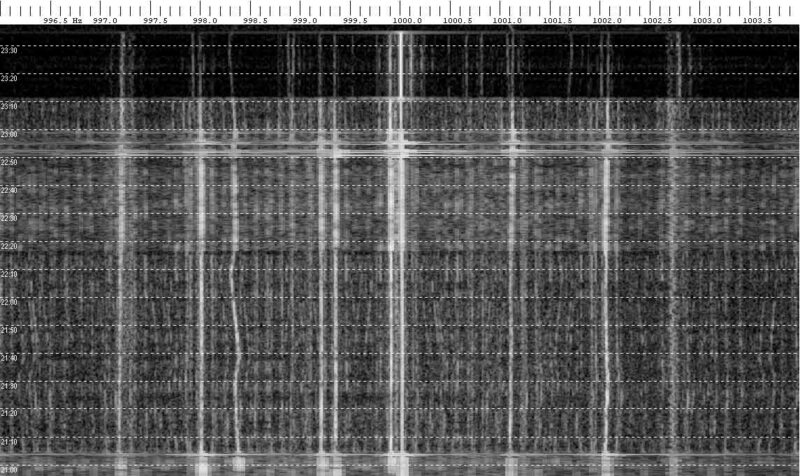 Steve's brief observation of his scan 24-25 Sept on 1660kHz shows: station sign-off's at 0458 and 0158 and 0307 the 0307 s/off is likely Puerto Rico; the other two likely Argentina. At 0550 8 carriers = 3 strong 5 weak; FCC data says 8 stations are on 1660 in the USA so I guess they are all there! 2 stations changing/switching transmitters at 0032UTC (but neither with drift signature that I saw at 0030 on previous night. 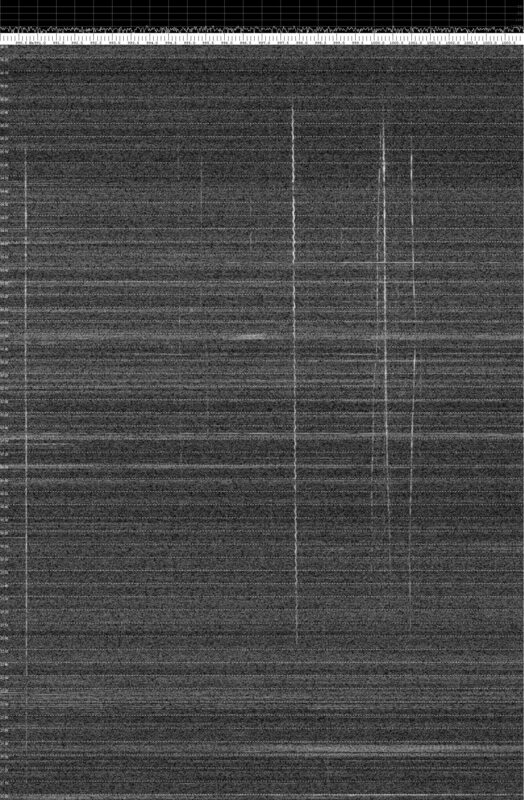 1 station powering down at 2330 - switching from a very stable transmitter to another with a very distinct FM signature. Sporadic E on Band 2 FM across the Atlantic.